Dr. Daneshvar received his B.S. in Physics from UCLA and his medical degree from Wayne State University. 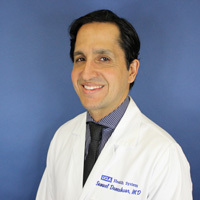 He continued his medical training at the LAC+USC Medical Center where he completed his Internal Medicine residency, a one-year specialty training in echocardiography, followed by his Cardiovascular Medicine fellowship. He was elected by his colleagues as Chief Fellow and recognized by the faculty as the Outstanding Fellow of the Year in 2012. Dr. Daneshvar enjoys developing the patient-physician relationship and making sure that patients are actively involved in managing their medical conditions. He enjoys practicing all aspects of cardiology including coronary artery disease, valve disease, and preventive care. He sees patients in both the Santa Monica and Westlake Village offices. He is fluent in Farsi. When not in the office, he enjoys spending time with his growing family, reading, and photography. Any disorder that affects the heart muscle is called a cardiomyopathy. Cardiomyopathy causes the heart to lose its ability to pump blood well. In some cases, the heart rhythm also becomes disturbed. This leads to arrhythmias (irregular heartbeats). Claudication is pain in your thigh, calf, or buttocks that happens when you walk. It may be a symptom of peripheral artery disease (PAD). This is when narrowed or blocked arteries reduce the blood flow to your legs. Daneshvar, SA. Letter to the Editor regarding article, "Outcome of patients with low-gradient "severe" aortic stenosis and preserved ejection fraction". Circulation. 2011 Sep 27;124(13):e361; author reply e362-3. Daneshvar S, Naqvi TZ. Carotid Intima-media Thickness and Carotid Plaques in Cardiovascular Risk Assessment. Current Cardiovascular Risk Reports, Volume 3, Number 2. March 10, 2009. 121-130. Shriki J, Rongey C, Ghosh B, Daneshvar S, Colletti PM, Farvid A, Wilcox A. Caseous mitral annular calcifications: Multimodality imaging characteristics. World J Radiol. 2010 Apr 28;2(4):143. Naqvi TZ, Rafie R, Daneshvar S. Potential Faces of Patent Forman Ovale (PFO PFO). Echocardiography. April 23, 2010. Daneshvar SA, Rahimtoola SH. Valve prosthesis-patient mismatch (VP-PM): A long-term perspective. J Am Coll Cardiol. 2012 Sep 25;60(13):1123-35. Daneshvar SA, Rahimtoola SH. CT Angiography for All Patients With Inconclusive Noninvasive Test? Clinical Perspective: "Not Yet". JACC Cardiovasc Imaging. 2011. Jul;4(7):752-3. Daneshvar SA, Rahimtoola SH. Still searching for the elusive Scarlet Pimpernel of today. Eur Heart J. 2012 Jun;33(12):1438-9. Epub 2012 May 2.